DBL - Art - Design Inspiration: Postcard project update! Just a quick post today! 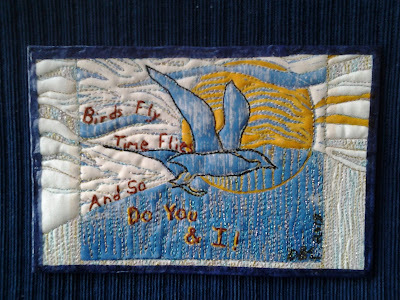 Here is a photo of my completed 4 inch x 6 inch postcard quilt for the Quilting Arts "Tempus Fugit" (Time Flies) Reader Challenge. The bird design is from a woodblock print I made as a teenager. Time has flown, and many decades later I am still creating!